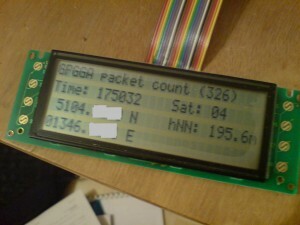 Today i tried to code a small programm that displays information from a GPS receiver on a LCD display. It receives the data via the UART and searches for the GPGGA dataset. If one is received the information (character strings) is written to a 4×27 character HD44780 display. Currently there is no convertion of the data to numbers and no calculations too. A future version might calculate the Maidenhead locator and the distance to a certain coordinate. At my side the programm is running on a Atmega8535 at 16MHz. This entry was posted in Microcontroller by mario. Bookmark the permalink.